Our phrase of the weekend is “bowl motivation”. Who’s already in, who’s jostling to make a New Year Day Bowl, and who simply needs one more win to qualify. With the number of bowls and landscape of college football, it is very likely that a 5-win team will make a bowl game. So who has something to play for? Let’s get into this week’s picks and find out. With a win Friday night, SMU becomes bowl eligible. As we saw last week against UCONN, the Mustangs can put up points and score from anywhere on the field. They also are susceptible to explosive plays. Memphis might have the most explosive running back in the nation in Darrell Henderson. There will be plenty of scoring in what I expect to be a back and forth game. This game opened at Minnesota +3, then sharp bettors caused a 5-point swing to where it currently stands. Why are sharps all over the Golden Gophers? Because they have something to play for, while Northwestern doesn’t. The Wildcats have already locked up a spot in the Big Ten Championship Game. For them, this week is about showing very little on film and getting out healthy. The Golden Gophers meanwhile, showed a fire they’ve been lacking in their dominant win against Purdue last week. Look for that intensity to continue on Saturday. While it might be odd seeing Notre Dame listed as the “home” team for a game played at Yankee Stadium, make no mistake about it, the stadium will be packed with the Golden Domers. In Yankee fashion, Notre Dame will be wearing what might be the most hideous pinstripe jerseys my eyes have ever seen. Syracuse has struggled away from the Carrier Dome this season, losing two of four games and allowing over 30 points per game. They offense has shown an ability to score, but has done so against some poor defenses. The Irish defense will be the toughest they’ve faced since Clemson, in which they struggled to move the ball. Ian Book returns to the Irish offense that did not skip a beat with his absence against Florida State. Look for the dynamic Book to get the Irish offense going early and often. West Virginia @ Oklahoma St.
West Virginia needs to win out to stay alive in the College Football Playoff conversation. ALL of the pressure is on them in this one. As we saw in last week’s shootout with Oklahoma, Oklahoma St. plays well as an underdog. I expect this to be a similar game, a high-scoring and close affair. This feels like a three or four point game. The first is Iowa State’s record ATS as an underdog under Matt Campbell. The second is Texas’ ATS record as a favorite. There are plenty of distractions headed into this game. Iowa St.’s star running-back David Montgomery is suspended for the First Half after being ejected last week against Baylor. Texas Head Coach Tom Herman was accused of cheating on his wife by former Ohio State assistant coach Zach Smith. True or not, it is a distraction for his team, who typically does not play well as a favorite to begin with. Iowa State has arguably the best defense in the Big 12. Expect them to handle business come Saturday Night and win a close one. We took a bit of a hit last week, so I hope your Sunday started off right with a nice Irish Coffee. (Hats off to Bray for the great fill-in work on the drinks section last week as well.) No surprise, we’re keeping up the trend of dominating this section with brown liquors, and this week we’re back to taking a look at Scotch. You can’t really go wrong with either of this choices, but one is slightly cheaper (and blended), so therefore a little less worthy in my mind. For the Winners: I was on a business trip this week and I found myself in the hotel bar (as you do) getting some food and watching Monday night football (surprisingly good game by the way). Since dinner only took me through the first half, I began to scan the shelves behind the bar for an appropriate digestif (it’s a word…I promise). 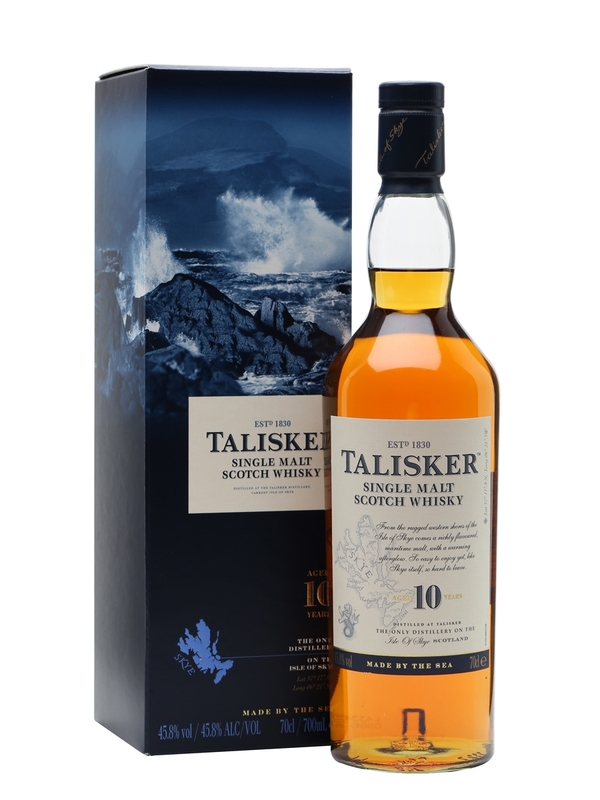 I came across a bottle of Talisker 10 Year Old and asked for a “wee dram” served neat. I gave it a good nose, let it open up for a bit and took a sip, and instantly found my new favorite single-malt. This is a delicious malt that contains all the smoky goodness of Lagavulin, but with a smoother flavor (think brown sugar or molasses) to tone down some of the peaty flavors for which Ron Swanson’s drink of choice is so famous. The 10 year version doesn’t brake the bank and is so good that I’m not even all that excited to shell out for the 18 year version if Bray ever hits the parlay. Enjoy my friends! For the Losers: This is not the first time a Johnnie Walker has found themselves in the losers’ section of these articles, and that’s not meant as a slight to them at all. (As mentioned before, Johnnie Walker is readily available and their standard Black Label offering is my go-to for weddings and similar functions.) In this case, the only reason they find themselves in the “penalty box” this week is because of price. They’re simply the more affordable option for a desired taste…and there are other single-malts I could put in their place. At any rate…if your looking for some great scotch but can’t quite shell out the cash for the Talisker 10, might I interest you in Johnnie Walker Double Black? (Don’t think…just say yes.) It’s been a little while since I’ve had this blend, but I did purchase a bottle for myself at the time, and it has long since been consumed. If you’re looking for something with a little more smoke, a little more flavor, and a little more maturity than standard Black Label, then go for the Double Black. At around $40-$50 a bottle, it won’t break the bank, but it still delivers on a fantastic tasting experience. Cheers!